James Russell wasn’t about to let the hospitalisation of his wife get in the way of their 57th wedding anniversary. The grandfather gave his bride, Elinor, a special anniversary when he donned a tuxedo and showed up at the hospital with flowers and chocolates. The tender moment was captured by granddaughter, Reid Russell, who shared the pictures on Twitter. 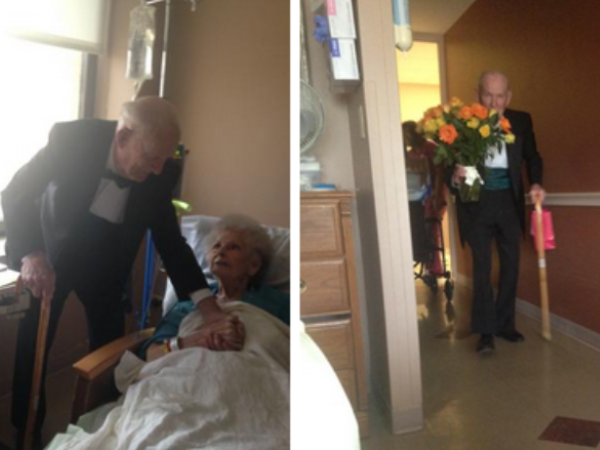 “My grandma is in the hospital, but it's their 57th anniversary, so he showed up in a tux to surprise her w flowers (sic),” read the tweet, which has been retweeted more than 37 000 times so far. According to ABC News, the couple enjoyed a meal together in the hospital room before watching their favourite shows including Jeopardy! and Wheel of Fortune. Elinor who has been in hospital for a month, appreciated her husband’s gesture.